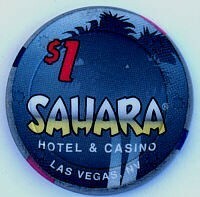 Sahara Casino One Dollar Chip ? Nearly new, but used, one dollar chip. The Sahara Hotel is out of business. All their chips and tokens are collectibles that will go up in value over time. No more will be issued.